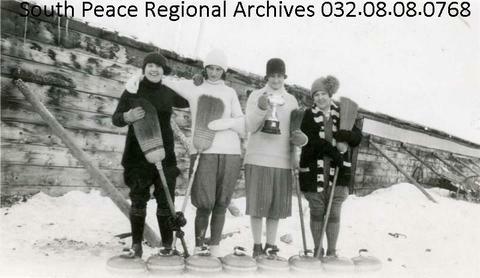 Sexsmith curling ladies in 1928 posed with brooms, rocks, and a trophy. Skip Mrs. Brown (left), ?, Mrs. Ellsworth Foy (holding cup), and ? presumably outside the Sexsmith Curling Rink.